Rotorua, centre of geothermal activity in New Zealand, we were both looking forward to our visit. 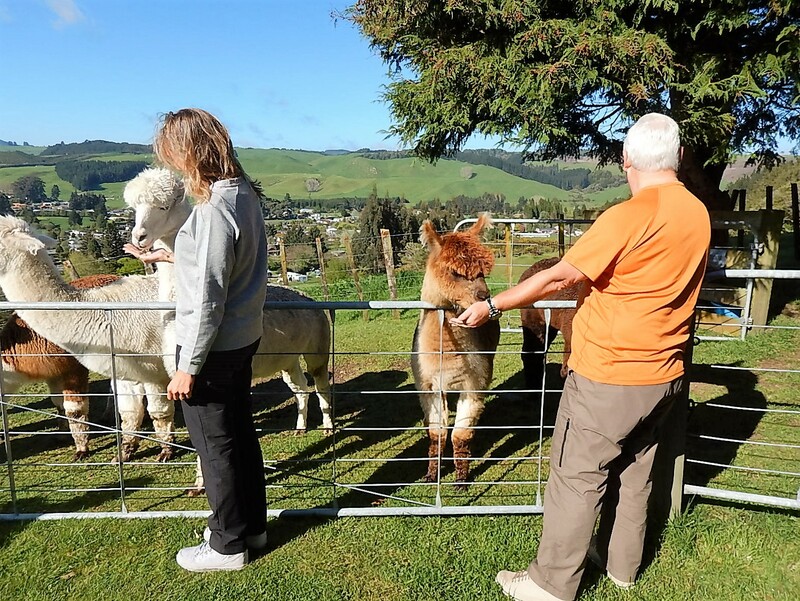 The town is set on the side of Lake Rotorua, a flooded volcanic crater with a lava dome forming an island in the middle. When we got there our first task was to find a shop selling hats; we have been advised that the clear air and thin atmosphere in NZ means the sun can be very strong and you can burn very easily so we wanted to buy a couple of proper protective sun hats, we soon found the right shop and purchased factor 50 sun hats with built in insect repellence, perfect. Next we drove down to the waterfront, the weather was closing in and it was quite late so most places had closed down for the day so it felt a bit like English seaside out of season! We found a café and had coffee and a doughnut before getting back in the car and setting off to find the City Lights B&B. On the way we pulled into a park which showed on the map as having geothermal sites, we walked around a whole range of hot mud pools, steam vents and bubbling hot springs, the whole place felt very otherworldly and had a distinct aroma of sulphur. City Lights was about 10 minutes outside Rotorua on the hillside overlooking the town, and the hills in the background. It was another modern house run by Angie and Leigh, ex-pat brits who are making a life for themselves in NZ. After serving us tea and coffee they showed us around the house, we had a nice room with a great view and access to a gym, hot tub and a lovely garden. 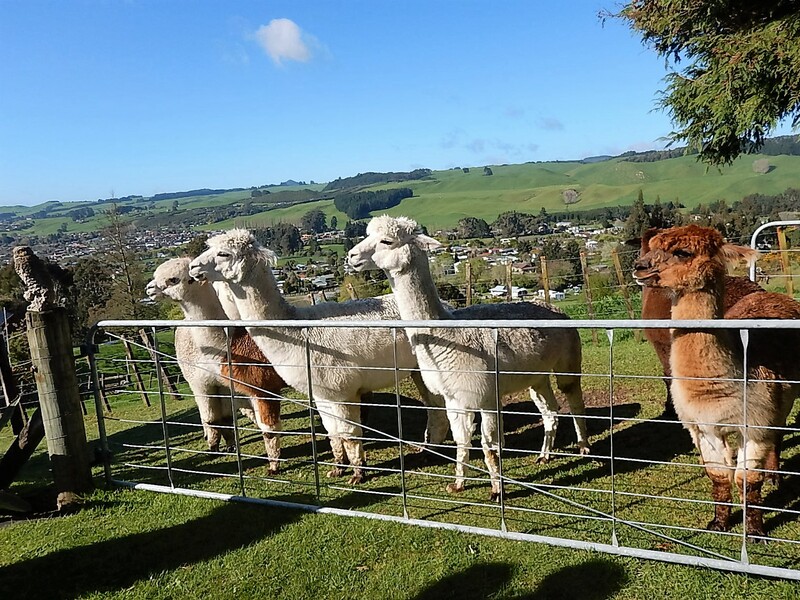 We also got to meet their pet Alpacas! It was a full house at City Lights on Wednesday night, a young Spanish couple were there on a honeymoon tour and a German couple checked in after us.Angie and Leigh recommended a few restaurants for dinner, Rotorua has a place called Eat Street which is a pedestrianised street lined with restaurants, we chose Leonardo’s a traditional Italian restaurant. Eat Street felt a bit like one of the food courts you get in shopping malls so we weren’t expecting much but we had a REALLY good meal, the antipasto platter we shared as a starter was particularly good. Nice surprise. When we got back to the B&B Angie and Leigh invited us to have a drink with them which rounded of the evening very nicely. 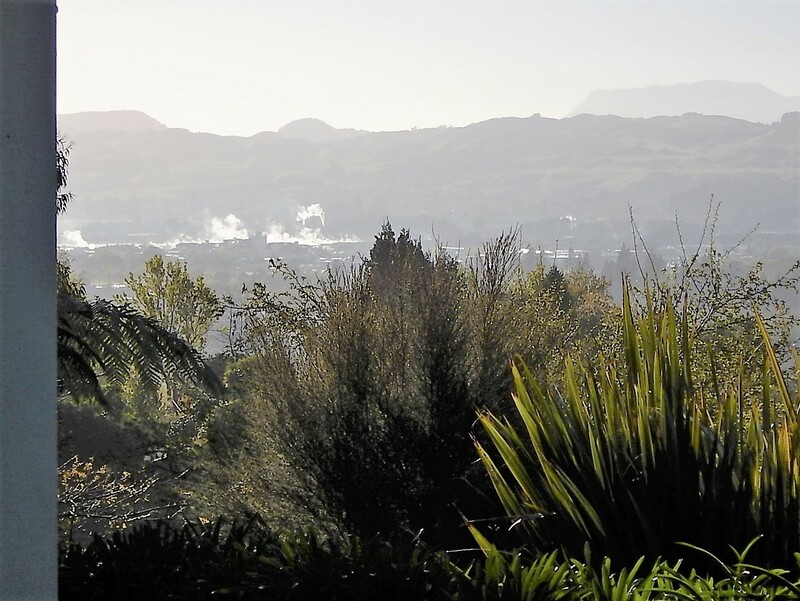 We had one full day in Rotorua, the weather forecast was very good and we wanted to explore the geothermal nature of the region and after running our plans passed our hosts we headed south out of town to a place called Waimangu Volcanic Valley. We donned our walking boots and walked the length of the valley from the visitor centre to the shore of lake Rotomahana, about 4km including a detour up the steep side of the valley to the crater rim. All through the valley we saw amazing hot springs, steaming lakes coloured blue and green by minerals from hot springs bubbling up into them. The plants in the valley were really lovely thriving on the warm damp conditions and in particular we saw some rare ferns growing along the hot streams. The scenery and the plants were great but the most amazing thing about Waimangu Valley is that it is only 130 years old. It used to be an area of scrub covered hills until 10 June 1886 when a massive volcanic eruption split the hills and created a line of craters which have been a constant source of geothermal activity ever since. With steam rising through the trees from vents in the ground and from the springs and hot streams the valley looks prehistoric, it was really strange to think it was actually a very recently created landscape. About 20 minutes from Waimangu Valley we found Waikite Valley Thermal Pools. Half way down the valley a hot spring pumps out 50ltrs of boiling water every second. The local community have harnessed this spring to create a series of thermal pools, in the process they direct the water through sprays and cooling pools to reduce the temperature from boiling to approx. 34-40 ⁰C – bath temperature. We tried all the pools and particularly enjoyed the ones that were sited on the edge of the valley with views across uninterrupted farmland and forest. It was really relaxing, we stayed as long as we could before setting off back to Rotorua wrinkled and happy!! That night we had reservations for a Maori cultural evening and traditional meal. We were picked up from the B&B and driven to the Mitai Maori ‘village’, a model village built to demonstrate traditional customs. We were welcomed by a Maori host who went through the audience (120+ people) asking everyone where they were from, he then proceeded to welcome each of us in our own language, English, French and German was impressive enough but there were people from Lithuania, Mauritius, China, Korea and many other places, 15 in all, it was very impressive. After that we walked down to a stretch of river running through an area of native bush and watched a crew of Maori warriors’ paddle by in a traditional war canoe; from there we were taken to a covered auditorium overlooking the model village and were treated to a display of traditional Maori songs and dances, and games they used to develop dexterity and weapon skills. They also demonstrated the Haka and explained the traditional facial tattoo’s worn by men and women. It was very well done, entertaining and informative, a good combination. We headed back to the dining hall where they served a buffet including Hangi, legs of lamb, whole chickens and potatoes which had been cooked for several hours over hot rocks in a covered pit. It was very good, and, as a concession to British visitors they served mint sauce and gravy with the lamb and stuffing for the chicken! With seafood chowder to start and a selection of desserts to follow we were very well fed. The last event of the evening was a guided walk through the dark forest and down to the river where we saw glow worms shining in the undergrowth along the river bank. Then it was back in the minibus for the ride up the hill to City Lights. Love the photos. We were very sorry when you left us and have been thinking about you often. We just returned from the trip to Doubtful Sound, it was great. Angie caught a shark!